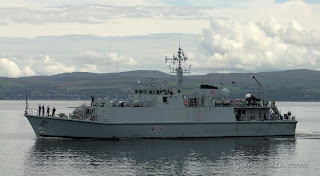 Seen between Toward and Bute, the 'Sandown' class minehunter GRIMSBY had just returned from a three-year stint of duty in the Persian Gulf. She left her base at Bahrain at the end of June and embarked on her seven-week, 7000-mile journey home to Faslane. Eight ports were visited during the voyage where GRIMSBY took on fuel and stores, and she passed through the Suez Canal on 28 July 2011, in the company of HMS CHIDDINGFOLD.